Maybe kebab and pizza sound like a weird combination at first, but it’s a really popular combo where I come from. 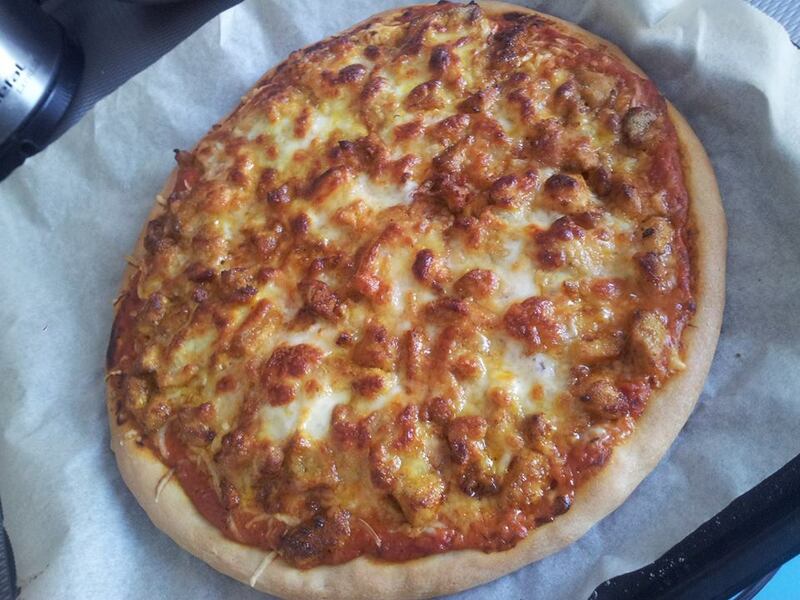 My favourite pizzeria served it and I couldn’t find anything just as good since I movied abroad. 3 tbsp of olive oil. 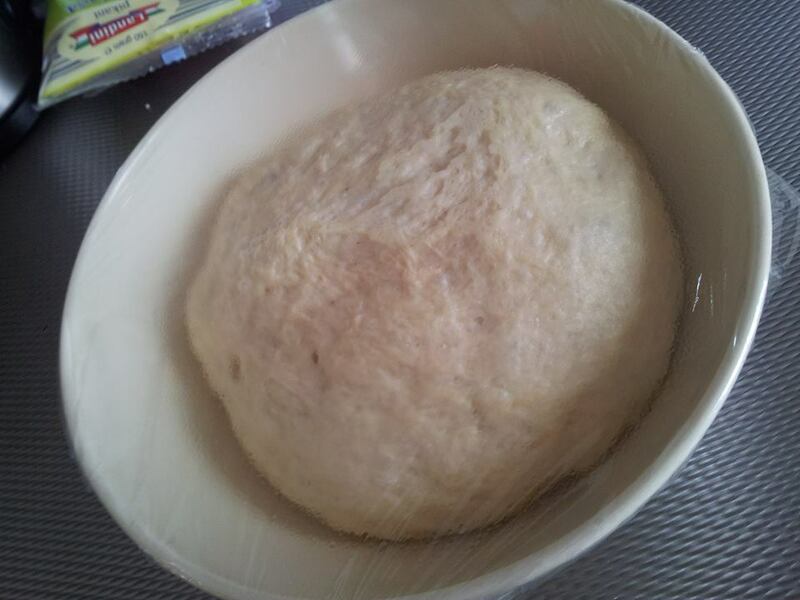 1) Make your dough by placing all your flour in a big bowl, add your salt and olive oil. In a cup or a mug mix your yeast, sugar and warm water. Let the yeast activate by letting them foam up (it will take about 5minutes). Remember that the water musn’t be too hot, just warm, or you’ll kill the yeast. 2) When your yeast is foamed up, add it to the flour and mix with your hand until the dough starts comming together. You may need to add a touch more water or flour, as flour absorbs water differently depending on the weather,day and some other factors. 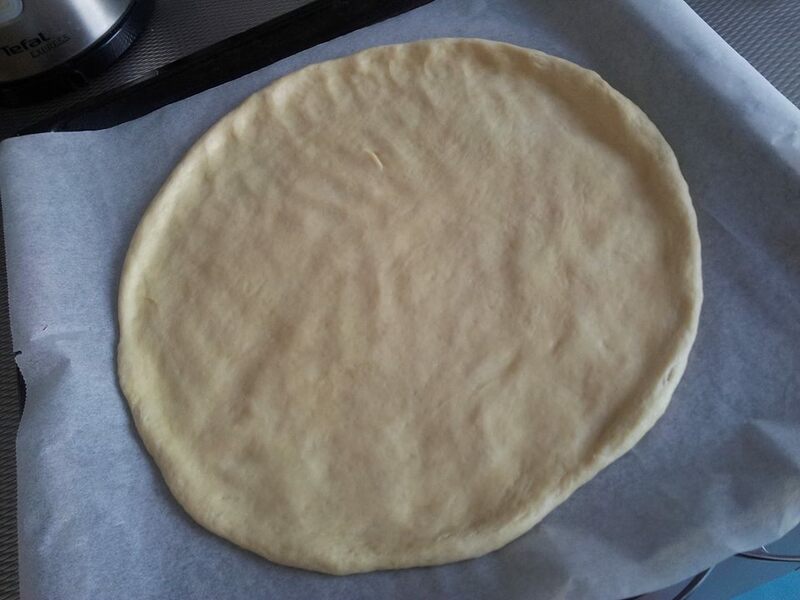 The dough needs to be soft, elastic and springy. I knead mine by hand and it takes me about 15min of kneading before the dough is nice and smooth. (good workout too!). When your dough reaches desired texture, put it into a clean,oiled bowl, cover with cling film and leave to double in size for about 2 hrs. 3) while your dough is rising, you can do everything else (Your salad topping, meat for the kebab filling and the garlic sauce). 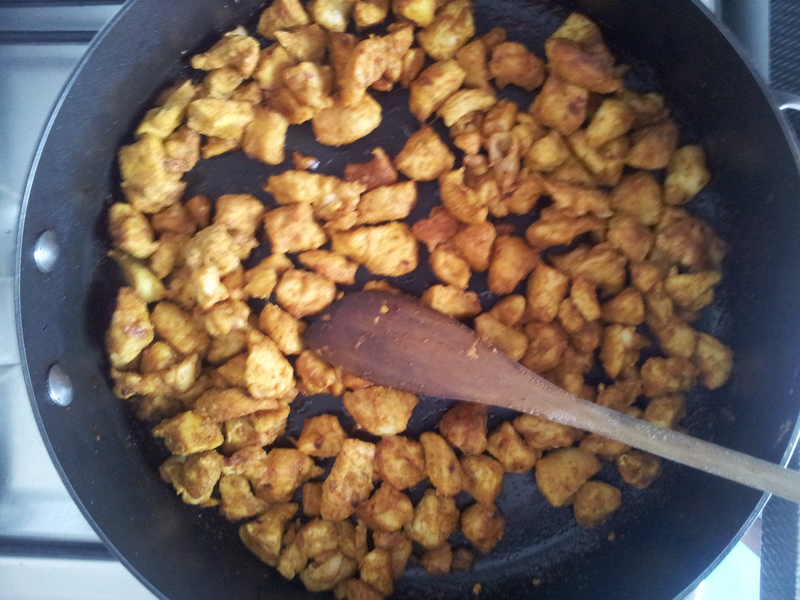 4) Meat for the kebab topping: dice your chicken pretty small, 2cmx2cm , season with salt,pepper,generous amount of garlic and curry powder.Add cayenne pepper and fry until golden and cooked through,on a minimal amount of oil.When ready,leave to rest while you prepare other things. 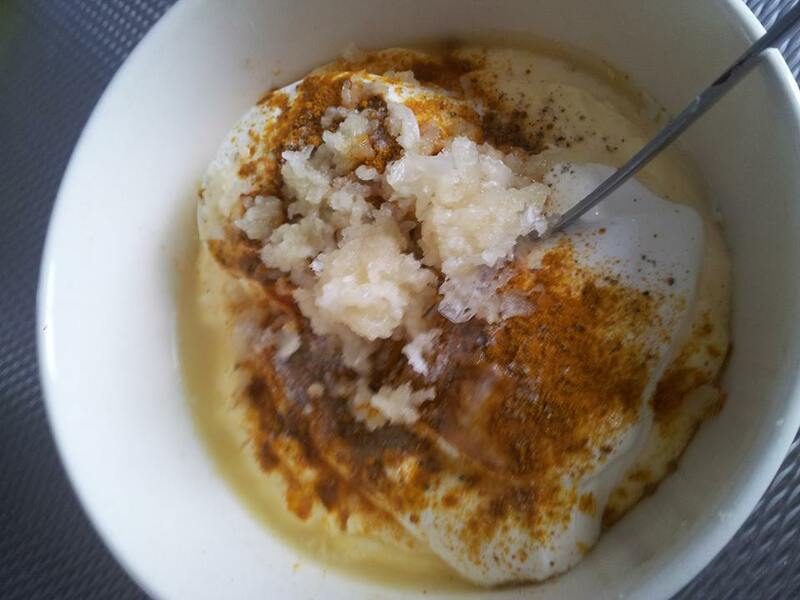 5) combine your mayo,yoghurt,turmeric powder,curry powder,remaining lemon juice. Chop your fresh garlic (or use the garlic press) and add to the mix. Season with salt and pepper. 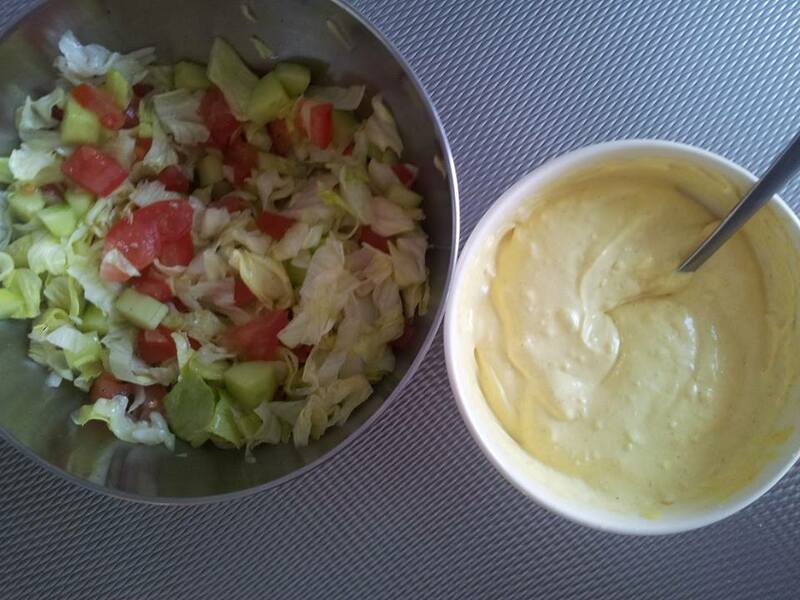 Mix well and leave in the fridge so the sauce gets a nice yellowish-golden colour from the spices. 6) remove the seeds from your cucumber and tomatoes. Dice them roughly and place in a bowl, chop your lettuce and add to the vegetables. season with salt,pepper and half the lemon juice. Mix well and place in the fridge so the flavours combine. 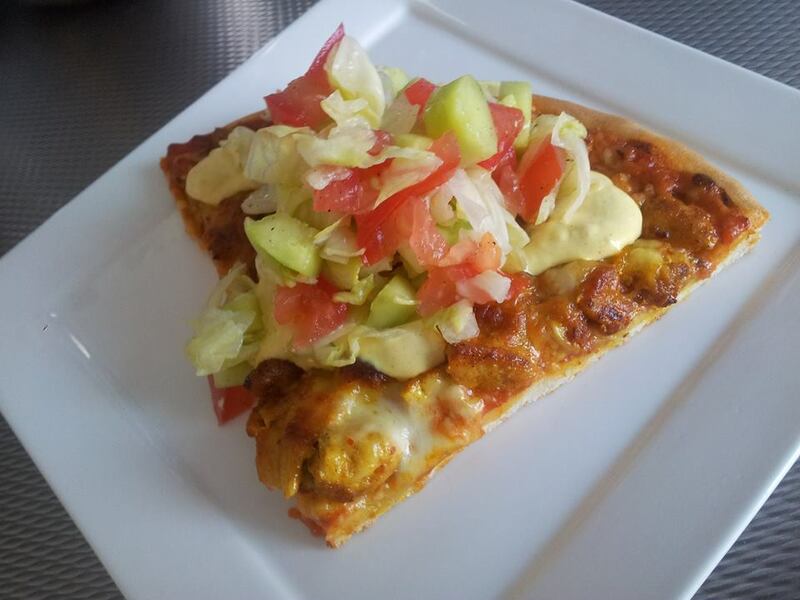 It might be weird to dress the salad so early on, but that’s how I remember it so that’s how I do it with this pizza topping, and it just works. 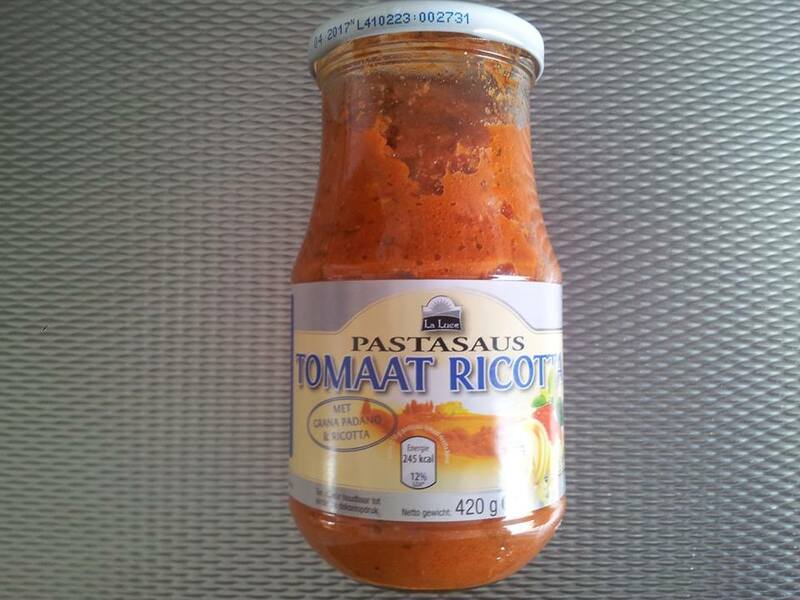 9) Take your tomato sauce, if you have home made – great, I use a store bought sauce I really like,it contains some ricotta so it’s mild and creamy, but feel free to use any brand you like the most. I smear all around,trying to be even, leaving the 1-2cm edge sauce-free. 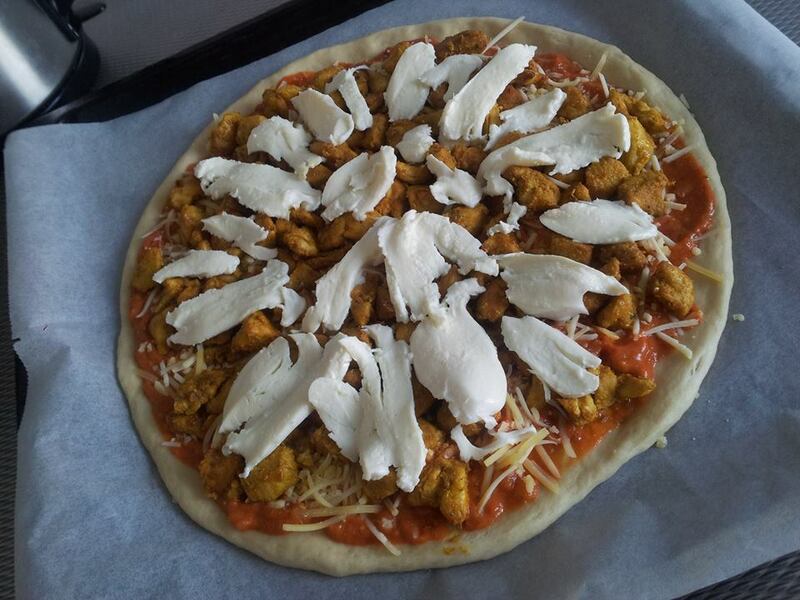 11) I place all my chicken pieces on the gouda layer and shred mozarella on top. that’s it! it’s pretty simple. Place your pizza in hot-hot-hot oven and bake until it’s bubbly,crispy,golden and ready. In my oven it takes about 15min for a big pizza, but PLEASE keep an eye on it because every oven bakes a little differently. I hope you’re gonna like it! it’s really worth trying out! enjoy! 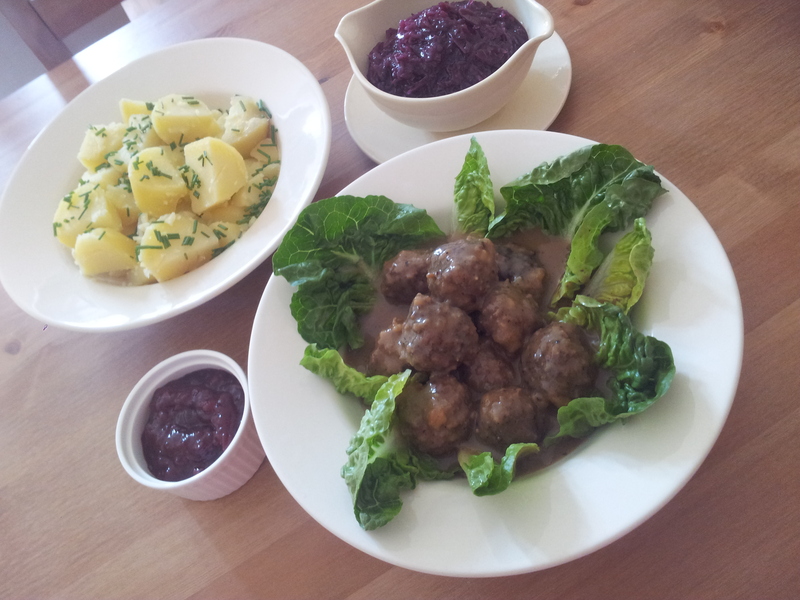 I know I say this A LOT, but swedish meatballs are really simple to make. I have been a fan of ikea meatballs for a while now, but I know that they’re not really made of meat.. therefore I have decided to try to make some of my own. I found a lot of recipes.. some really basic and some weird- with a grated apple in the meat mix.I decided to stick to the basic version at first..and when they came out all delicious and divine, I was sold. 1 medium onion, shredded or finely diced in a food processor. 8-10 slices of simple white toast bread, no crusts! After 3-4 hours minimum, you can use your meat mix. form about 25 walnut sized meatballs , preheat a heavy based skillet with a bit of oil and brown your meatballs evenly.Once they’re all browned , remove from the pan and set aside for now. possibly worcestershire to taste( if you don’t like it leave it out). Use the oil you have in the pan (some more should come out of the meat when we’re browning the meatballs) to make a dark roux. ( mix of fat and flour that’s been fried off and used to thicken the sauce). Add the butter into the pan and mix with a wooden spoon,making sure all the carmelised bits and leftover of the meatballs that were in the pan are loose and off the bottom of the skiller. They will flavour the sauce, but we don’t want them to burn. Once your roux is ready, add your beef stock and keep mixing-I like to use a whisk at this stage, it prevents any lumps from forming in the sauce.Keep stirring and heating up the sauce continously until the sauce thickens up. Then season it to taste with salt, pepper and nutmeg, add the cream , 1 tbsp of worcestershire sauce then mix them in well. Add all of your meatballs back into the pan full of sauce, cover them well with sauce,put the lid on, turn the gas onto the lowest possible setting and simmer for about 15 min, or until the meatballs are cooked through. (NOTE: the sauce does need a good grating of nutmeg just to offset the flavours in the meat). Jello cake, perfect for kids. Jello, or as we call it in polish “galaretka”, is an awesome,awesome thing. It’s sweet,fruity,refreshing, it wobbles..and you can make it out basically anything. Wine,tea,fruit juices,champagne,booze,beer-You name it! 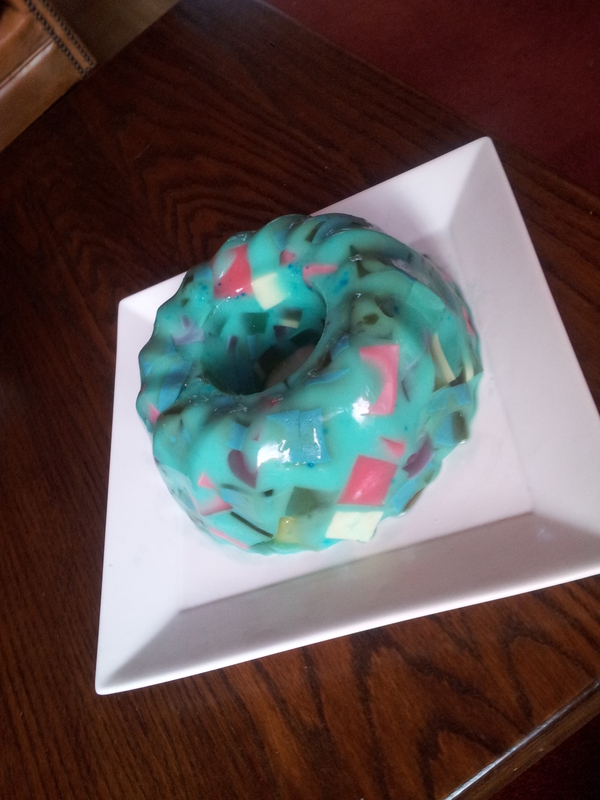 This is a jello cake I made in a bundt cake form (in polish it’s babka form). I used store bought jello powders, mainly because of the intense colours. This fake-cake serves about 10-12 slices. 2) I put the jello powders in separate bowls( all jello powders apart from the 2 gooseberry jellos,those I reserve for later.) cherry and strawberry go into separate bowls, kiwi&apple can go in together,because it’s the same flavour.Add boiling water,mix until the powder is disolved. When the mix is a bit cooler, add half of the cherry jello into a separate bowl, also add half of the kiwi&apple jello into a separate bowl. You should have 5 bowls by now. 3) Add a few drops of red food colouring into the strawberry jello and make it even more red and intense. 4) Add a few drops of blue colouring to half of the cherry jello to make it nice and dark blue. Add only a tiny bit of the blue colouring to the remaining cherry jello to make it purple. 5) Add a bit of blue to the half of the green jello to make it turqoise, leave the other green jello as it is. 6) When all the mix is starting to cool significantly,add a splash of cream to all of them,that will make the colours pop and they won’t be see through anymore. Pour all the jellos into separate containers and leave in the fridge to set. The colours will split , because the cream will float to the top,giving you a cool double-effect jello. 7) When the jellos are setting, mix your remaining two jellos with hot water (about 800ml for both of them), stir until disolved, let it cool,then add a few drops of blue colouring and some cream- that is going to be your jello casing for all the jello pieces, and you want it to be nice colour such as turqoise-aqua green-blue sort of thing. 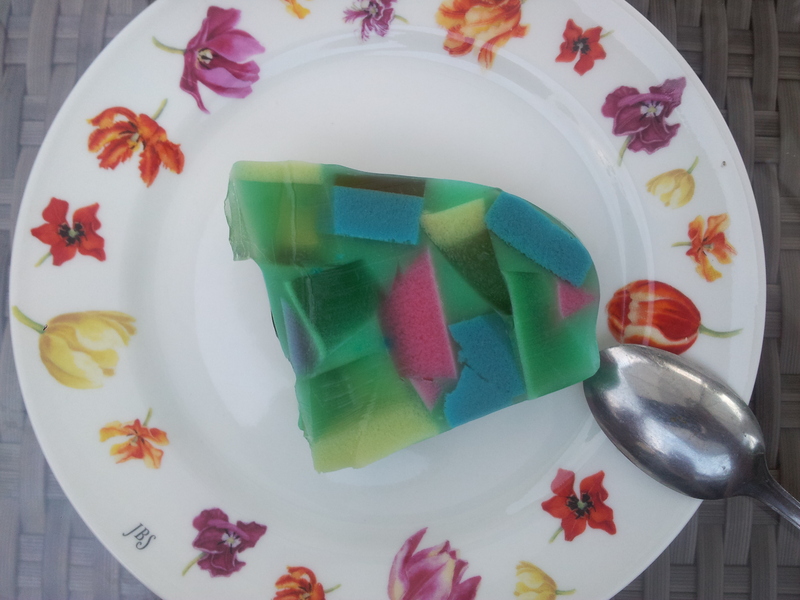 8) Remove all your set jellos from the fridge,cut into rough squares or other shapes. 9) Grease your bundt cake tin with a tiny bit of butter. (I mean TINY!) , place all of your jello cubes in, overlapping the colours,so its nice and psychodelic..then pour over the cooled turqoise jello. Let it set in the fridge overnight. 10) When you’re ready to serve, just place the tin in a sink full of hot water for about 5 seconds. The jello will slide easily out of the form that way.